In this clip from Wednesday's new Botched episode, Laura explains how she ended up with one nostril instead of two. Spoiler: it began with an unfortunate incident 11 years ago, when her dog Brutus got more than a little too excited to greet his owner. "What happened to me was a complete accident," she tells the camera. "I went to kiss the top of his head and he came up at the same time and broke my nose." And that's far from the worst of it. "His tooth went through the middle of my nose. So this part and this part," Laura continues, pointing to the now-empty space where her septum should be, "It was not attached." 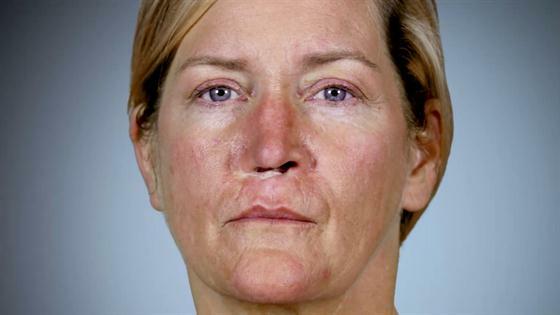 Once the initial wounds had healed, Laura found a plastic surgeon to reconstruct those portions of her nose that she'd lost in the accident. But, at just a few days post-op, something didn't feel right. When she returned to see the doctor, he confirmed what she already suspected to be true. "He said, 'Well, it's infected. This is probably gonna fall apart,'" Laura remembers. Now, Laura and her boyfriend plan early-morning grocery store trips to avoid being around other people. "There's a hole in my nose now that leads directly down to my throat. Everything's gone," she says. "When I go to public places, I'm always strategically standing in a certain way because anywhere I go, people stare at me. I always have my hands around my face." Hear more about Laura—and the freak accident that cost her a nostril—in the clip above!